Davis Mechanical Corp is proud to serve the Quincy community! About Quincy, MA - Happy to be your hometown Heating & Air Conditioning Contractor! Quincy is a Norfolk County, Massachusetts city with a population of nearly 93,000 residents. It is the eighth largest city in the stare by population, and it is the birthplace of several prominent U.S. political figures, including John Adams, John Quincy Adams, and John Hancock. Historically, the granite and shipbuilding industries were prominent to the city’s economy, but more recently, businesses like Dunkin Donuts and Howard Johnson’s were started here. Students attend Quincy Public Schools through the time they graduate high school, and higher education options in the community include Quincy College and Eastern Nazarene College. Quincy is home to a variety of attractions and historical sites. 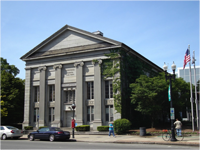 History enthusiasts may enjoy a visit to the Quincy Historical Society or the Adams National Historical Park, which explores the lives of John Adams and John Quincy Adams. The USS Salem and the United States Naval Ship building Museum are also located in the community. Outdoor recreation is also popular in Quincy. The city is home to 27 miles worth of coastline and over 10 beaches that offer trails, swimming, and picnicking. Some of the most popular include Hough’s Neck’s Parkhurst and Squantum’s Nickerson Beach. There is also a variety of boating, sailing, and charter opportunities to allow visitors and residents alike to better explore Marina Bay. Quincy has a continental climate located with a transitional region between a humid continental and a humid subtropical climate zone. Winters vary between periods of snow and cold rain, and temperatures are cold. Average highs in mid-January just barely exceed the freezing point, so residents rely on heat pumps and home furnaces to stay safe. During the summer, temperatures vary from warm to hot, and they are often humid and rainy. These months can be uncomfortable, so residents are smart to have a properly-serviced air conditioning system in place for when they need to cool off.